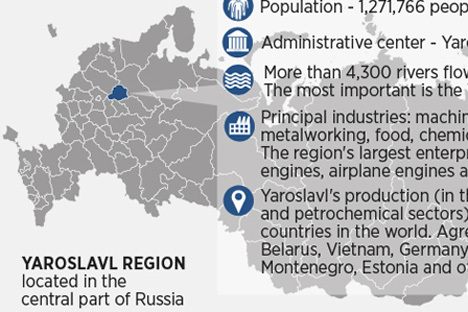 Despite the sanctions, the volume of investment in the Yaroslavl Region is only increasing. At the Sochi Forum, the governor of the region Sergey Yastrebov told RBTH which industries investors from Asia are found in. We have traditionally had a wide range of investors from Europe and the USA as well as from Asia. Of course we have now started to develop relations more actively with Asia specifically. Here we traditionally work with Japan. The main spheres are in innovative medicine and automobile manufacturing. For example, the Russian Endoscopic Research Center was founded and is functioning with the support of Kanazawa Medical University. During the time of the project's activities more than 500 doctors became qualified. Since 2010 the Komatsu factory has been working, which produces dump trucks and excavators used in construction. In 2012, the construction of a new pharmaceutical factory for the manufacture of prepared medicinal forms that belongs to the Takeda Group was completed. And now the Mitsubishi Company is considering the possibility of establishing the manufacture of engines for automobiles assembled in Russia. We have two areas of cooperation with China - energy and tourism-logistics. Related to India and on the theme of pharmaceuticals, we have signed an agreement with Cadila Pharmaceuticals Ltd. on the construction of a pharmaceutical factory in the Region. An agreement was also signed on research in the IT sphere with Indian partners from the university APIIT SD India. The Region also works closely with Vietnam. Here we are talking mainly about the export of Yaroslavl’s products - this is gas-pumping equipment and gas turbine units, as well as the products of Yaroslavl shipbuilders. Interest on the part of investors from Asian countries is growing steadily. In principle this is understandable. It is not just about the favorable geographical position of our region, its infrastructural capabilities, and personnel potential.